Most of the experts at Scotland's main fingerprint bureau continue to believe a print left at a murder scene belonged to Shirley McKie, MSPs have been told. The claim was made as a parliamentary inquiry into the Scottish Fingerprint Service (SFS) began at Holyrood. Ms McKie, a former Strathclyde Police officer, was accused of leaving her fingerprint at the home of Kilmarnock murder victim Marion Ross in 1997. Ms McKie always denied the print was hers and was later cleared of perjury. 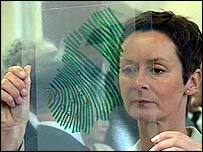 Ministers said that "an honest mistake" had been made in identifying Ms McKie's fingerprint at the murder scene. Earlier this year the Scottish Executive paid Ms McKie, from Troon in Ayrshire, an out-of-court settlement of £750,000 in compensation. The latest inquiry is intended to restore confidence in the fingerprint service. The Scottish Parliament's Justice 1 Committee began the inquiry on Wednesday. It heard there were a wide range of opinions among staff in the fingerprint service as to whether the print was Ms McKie's. Nationalist MSP Bruce McFee asked Ewan Innes, the head of the SFS, whether the majority of staff in the service's Glasgow office, the largest in the country, believed that the court was wrong. Mr Innes said: "There are a majority of experts who work for me in Glasgow who believe the identification was correct." Mr McFee also referred to a letter signed by 50 fingerprint staff concerning the McKie case. He said: "Four of them disagree that a mistake was made at all, another five experts signed the letter saying that they carried out comparisons and insist that it is still Shirley McKie's fingerprint. "Another 41 expert employees have also signed stating that any settlement with the McKies will have 'a detrimental effect on the future presentation of fingerprint evidence in Scotland'." The West of Scotland MSP said that until staff accepted a mistake had been made, they would not accept change was needed in the service. However, Mr Innes said the letter "exemplified the diversion of views and opinions that exist over the identification in 1997". Deputy Chief Constable David Mulhern, the man who drew up a 25-point strategy to reform the fingerprint service, told the inquiry that the organisation had been going through a crisis and that staff were in favour of change.